TSLPRB Police SI, Constables PMT, PET dates (Physical Events Dates) 2018 : Submission of Part 2 Online application at TSLPRB website. TSLPRB Police Constables PMT,PET dates-Call/Intimation letter download @tslprb.in. TS PCs Physical Measurement- Efficiency Tests Dates:: TSLPRB Police Constables PMT,PET dates-Call/ Intimation letter download, Certificate verification date. Police Constables PMT,PET Verification schedule download intimation letters www.tslprb.in ,TSLPRB Constables posts Events Verification Posts Physical Measurements,Efficiency Tests Dates 2018-2019,TS constables PMT,PET Schedule, Hall Tickets Download.Telangana State Level Police Recruitment Board www.tslprb.in , TSLPRB TS Police Constable Recruitment PMT, PET dates 2018-2019, TS SIs Physical Measurement-Efficiency Tests Dates. 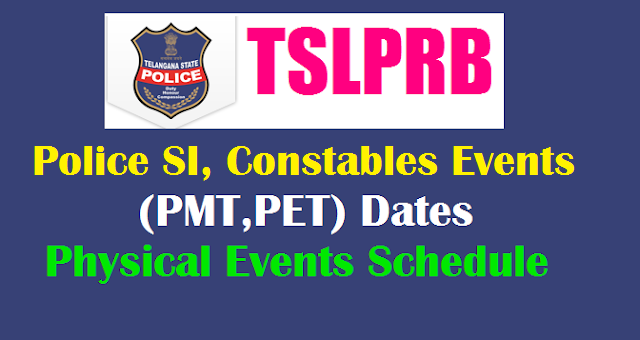 TSLPRB SIs Recruitment PMT, PET Dates, Certificate verification dates, TSLPRB Physical Measurements Tests/Physical Efficiency Tests Dates for TS Police Constable Recruitment. Telangana State Level Police Recruitment Board has announced the Police Constables, SI recruitment PMT/PET dates and certificates verification dates. 1. ఎస్సై, కానిస్టేబుల్ పోస్టుల భర్తీకి ఫిజికల్ ఈవెంట్స్‌ను డిసెంబర్ రెండోవారం నుంచి నిర్వహించేందుకు తెలంగాణ రాష్ట్రస్థాయి పోలీస్ నియామక బోర్డ్ (టీఎస్‌ఎల్‌పీఆర్బీ) సిద్ధమవుతున్నది. 2. ఇప్పటికే ఎస్సై ప్రిలిమ్స్‌తోపాటు కానిస్టేబుల్ ప్రిలిమ్స్ పరీక్ష ఫలితాలను విడుదలచేసిన బోర్డ్.. అక్టోబర్ చివరివారం నుంచి ఎస్సై అభ్యర్థులకు దేహదారుఢ్య (పీఎంటీ: ఫిజికల్ మెజర్‌మెంట్స్ టెస్ట్, పీఈటీ : ఫిజికల్ ఎఫిషియెన్సీ టెస్ట్) పరీక్షలు ప్రారంభించాలని భావించింది. 3. కానీ, రాష్ట్రంలో అసెంబ్లీ ఎన్నికల ప్రక్రియ మొదలు కావడంతో పోలీస్ సిబ్బంది ఎన్నికల బందోబస్తుపై దృష్టిపెట్టింది. దీంతో ఫిజికల్ ఈవెంట్స్ నిర్వహణకు ఆలస్యం అనివార్యంగా మారింది. 4. ఫిజికల్ ఈవెంట్స్‌లో భాగంగా అర్హులైన అభ్యర్థులకు పార్ట్-2 దరఖాస్తునకు త్వరలోనే తేదీలను వెల్లడిస్తామని టీఎస్‌ఎల్‌పీఆర్బీ చైర్మన్ వీవీ శ్రీనివాసరావు కానిస్టేబుల్ ప్రిలిమ్స్ ఫలితాల విడుదల సందర్భంగా ప్రకటించారు. 5. ఎంపికలో పారదర్శకత, తక్కువ సిబ్బందిని వినియోగించేలా ఈసారి పీఈటీ, పీఎంటీ పరీక్షల్లో సాంకేతిక పరిజ్ఞానాన్ని వినియోగించనున్నామని ఉన్నతాధికారులు తెలిపారు. 6. హైజంప్ మినహా రన్నింగ్, లాంగ్‌జంప్, షాట్‌పుట్‌లో టెక్నాలజీని వినియోగించనున్నట్టు టీఎస్‌ఎల్‌పీఆర్బీ వర్గాలు వెల్లడించాయి. పోలీస్ ఉద్యోగాల ఫిజికల్ ఈవెంట్స్ తేదీలను టీఎస్‌ఎల్‌పీఆర్బీ ఖరారు చేసింది. డిసెంబర్ 17 నుంచి ఫిజికల్ మెజర్‌మెంట్ టెస్ట్ (పీఎంటీ), ఫిజికల్ ఎఫీషియెన్సీ టెస్ట్ (పీఈటీ)లను నిర్వహించనున్నారు. ఎస్సై, కానిస్టేబుల్, ఏఎస్సై వివిధ క్యాటగిరీల్లో మొత్తం 3,77,770 మంది ఈవెంట్స్‌కు ఎంపికైనట్టు పేర్కొన్నారు. ప్రిలిమ్స్‌లో ఎంపికైన అభ్యర్థులు పీఎంటీ, పీఈటీ కోసం పార్ట్-2 దరఖాస్తును నింపి, 29-10-2018 ఉదయం 10 గంటల నుంచి నవంబర్ 18 అర్ధరాత్రిలోగా సమర్పించాలి. పీఎంటీ, పీఈటీలు రాష్ట్రవ్యాప్తంగా 13 చోట్ల నిర్వహించనున్నారు. డిసెంబర్ 17 ప్రారంభమయ్యే ఈవెంట్స్‌ను 35 నుంచి 40 పనిదినాల్లో పూర్తిచేసేలా ప్రణాళిక రూపొందించారు. పీఎంటీ, పీఈటీలకు హాజరయ్యే అభ్యర్థులు పార్ట్-2 దరఖాస్తును నింపే సమయంలో తప్పులు దొర్లకుండా జాగ్రత్తలు తీసుకోవాలి. ఏయే తేదీల్లో పీఎంటీ, పీఈటీలు ఉన్నవో వెబ్‌సైట్‌లో త్వరలోనే వెల్లడిస్తారు, ఆ రోజు అడ్మిట్‌కార్డు తీసుకురావాలి, బయోమెట్రిక్‌లో వేలిముద్రలు సరిపోలితేనే అనుమతిస్తారు. ఎస్సై, కానిస్టేబుల్ దరఖాస్తులు నింపే సమయంలో తప్పుగా ఎక్స్ సర్వీస్‌మెన్ కోటా అనే ఆప్షన్ దగ్గర అవునుఅని పెట్టామని, మరికొందరు కులం తప్పుగా ఇచ్చామని, సరిచేసుకునేందుకు అవకాశం ఇవ్వాలని చేసిన విజ్ఞప్తులను పరిగణనలోకి తీసుకున్నారు, సరిచేసుకోవచ్చని తెలిపారు. ఎక్స్ సర్వీస్‌మెన్ కోటా కింద ఉన్న కనీస అర్హత మార్కులతో (ఓపెన్ క్యాటగిరి, బీసీ, ఎస్సీ, ఎస్టీ క్యాటగిరీలో అర్హత సాధించాల్సినన్ని మార్కులు రానట్లయితే) ఫిజికల్ ఈవెంట్స్‌కు ఎంపికైన అభ్యర్థులు ఆటోమెటిక్‌గా అనర్హులు అవుతారు. Telangana State Level Police Recruitment Board issued Notifications on 31-05-2018 for direct recruitment of 1,217 vacancies of SCT SI Civil and / or equivalent Posts, 29 vacancies of SCT SI IT&C, 26 vacancies of SCT ASI FPB and 16,925 vacancies of SCT PCs Civil and / or equivalent Posts, 231 vacancies of SCT PCs Technical (IT&C, PTO Drivers and PTO Mechanics). As per the Recruitment Procedure, Preliminary Written Tests (PWTs) were conducted on 26thAugust 2018 for SCT SI Civil and / or equivalent Posts, on 9th September 2018 for SCT SI IT&C and SCT ASI FPB and on 30th September 2018 for SCT PCs Civil and / or equivalent Posts. On the basis of these PWTs, Candidates who achieved the minimum prescribed qualifying mark or above – pertinent to their Community / Ex-Serviceman Status have qualified to participate in the next stage of Recruitment viz., Physical Measurement Tests and Physical Efficiency Tests. Additionally, all those Candidates who applied for the 231 vacancies of SCT PCs Technical (IT&C, PTO Drivers and PTO Mechanics) will be administered Physical Measurement Tests and Physical Efficiency Tests (PMT / PET). Details of the Candidatures (initially) for the PMT / PET to be held tentatively from 17th December 2018, Monday are as follows..
PMT / PET will be conducted at 4 Venues / Grounds in Hyderabad (for Hyderabad and erstwhile RR District Candidates), at 2 Venues / Grounds in Warangal and at 1 Venue / Ground in each of the Headquarters of the other erstwhile Districts of Karimnagar, Khammam, Mahbubnagar, Nalgonda, Sangareddy, Adilabad and Nizamabad and this process is likely to be completed within a period 35-40 working days. All the Candidates participating in PMT / PET as detailed above have to fill their Part- II (Final) Application Form, Online, by logging on into their User Account on the TSLPRB Website www.tslprb.in between 10 a m on 29th October 2018, Monday and 12 midnight on 18th November 2018. It may please be noted that Part-II Application has to be filled along with uploading the photocopies of the relevant Certificates / Documents and it will take substantial time to fill-up the Form completely. For the aforementioned purpose, Candidates are advised to keep all the relevant Certificates / Documents readily available for scanning and uploading. Nearly 3 lakh Candidates have to fill-up their Part-II Application Form in these 21 days at an average of nearly 15 thousand per day. During the procedure, the Candidates are advised to take personal care while typing or choosing various entries in the Application Form and in ensuring that only photocopies of their relevant Documents / Certificates are uploaded at the appropriate slots / places. Candidates are cautioned not to leave it to Operators of Photocopy / Net Centres. They may take the assistance of the Operators of Photocopy / Net Centres, yet, they should be personally present and see to it that right information and uploads are provided in their Online Application Forms. They will be personally held responsible for any discrepancy, erroneous information, and undeserved claims figuring in their respective Applications. The Board has been receiving quite a few applications from Candidates saying that they had erroneously claimed Ex-Serviceman Status and that the Status has to be changed now. In all those cases that have been brought to the notice of the Telangana State Level Police Recruitment Board, action has been taken to effect the necessary modifications in the Applications. In very few cases wherein Candidates requested modification in their data (including Community Status), Board has been taking suitable action. Consequently, certain Candidates who qualified in the PWTs earlier by virtue of the erroneously claimed Ex-Servicemen Status (especially belonging to Other Communities and Backward Classes) are disqualified now as they got less number of marks than the minimum marks of qualification designated for their Community. All such changes in the Status of Qualification (as discussed in the aforementioned paragraph) are being issued as a Corrigendum to be published in the Login Area of the Candidates in the TSLPRB Website www.tslprb.in. Individual Candidates who are getting affected will also be informed in change of their Qualification Status through text messages on their Registered Mobile Numbers. All the Candidates who qualified for the PMT / PET and whose Ex-Serviceman Status is showing as ‘Yes’ are requested to check once again if they had wrongly claimed the Ex-Servicemen Status and inform in writing to the Board wherever required so that their genuine qualification can be assuredly determined to avert any disappointment at further Stages of the Recruitment Process. It is clarified once again that whoever qualified by virtue of Ex-Serviceman or any Community Status, by making a wrong claim of such Status is automatically disqualified and there is no use of such Candidates continuing any further in the Recruitment Process. As already mentioned above, in the continuous process of this Recruitment that started with issue of Notifications on 31st May 2018, the Physical Measurement Tests and Physical Efficiency Tests will be conducted from 17th December 2018 onwards for a duration of 35-40 working days in these Cities / Towns: Hyderabad, Warangal, Karimnagar, Khammam, Mahbubnagar, Nalgonda, Sangareddy, Adilabad and Nizamabad. Part-II Online Application can be filled along with uploading of documents on all the 21 days starting from 10 a m on 29th October (Monday) till midnight on 18th November 2018 (Sunday) and Candidates will not be able to fill up their Part-II Application after 12 midnight on 18th November. Therefore, they are requested to complete the procedure well in advance without delaying it till the last moment. It may please be noted that this deadline will not be extended in any circumstances and only those Candidates who have satisfactorily filled their Part-II Online Application Form will be allowed to participate in Physical Measurement Tests and Physical Efficiency Tests. or 040-23150362 & 040-23150462 by mentioning the above details.